Home » Blogs » 7GenGames » Freebie Friday: Don’t Get Dumb While Stuck at Home Because of the Blizzard! Freebie Friday: Don’t Get Dumb While Stuck at Home Because of the Blizzard! Now that a good portion of the country has dug itself out of the massive blizzard that struck earlier in the week, people are returning to work and school. The East Coast blizzard is just a reminder how Mother Nature or in this case, El Nino, will present unexpected weather obstacles throughout the country this winter. Missing school because of bad weather is a fun escape for kids but not so much for parents and educators. A couple of days might turn out being a week or more, depending on how severe the storm conditions are. Students need to keep their brains engaged and learning while at home, and there’s nothing better than doing so through a learning activity. It might be cold, wet and snowing outside but here’s a much needed ray of summer. 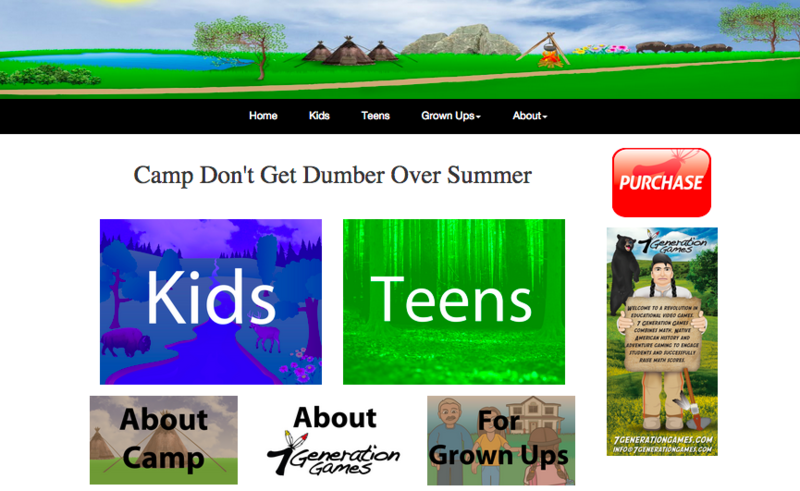 Last year we launched a free resource site, Camp Don’t Get Dumb Over Summer, aimed at keeping kids learning and challenged through fun, educational games. The site is a great educational resource, offering FREE games, videos and activities with an emphasis on math and history. The resource site is aimed at both kids (grades 3-6) and teens (grades 7-12), with the content designed to keep math skills up and students entertained. We’ve shared this resource site before and will continue to do so, especially when kids are at home for a prolonged period of time, looking for new ways to engage their minds. Your students will love the resources and if they want to try new adventures and challenges, you can always purchase our games: Spirit Lake and Fish Lake. As a special offer, through the month of January, you will also get the beta of Forgotten Trail with every game purchase or donation.